In a mixing bowl whisk together cornstarch and water. Add in eggs, salt and pepper and whisk until well combined. Heat a 12-inch non-stick skillet on the large burner of your stove over medium heat for 1 – 2 minutes. Add in coconut oil and spread to coat pan. Pour in egg mixture and lift and tilt pan (as if making crepes) to coat entire bottom surface of pan with egg. Let cook about 2 – 3 minutes (while continuing to lift, tilt and swirl pan as needed so you have an even layer of egg), until bottom is set and top is just lightly wet but mostly set as well. Loosen edges of egg wrap using a flat spatula, then slide spatula under wrap and carefully flip to opposite side. Immediately sprinkle wrap evenly with cheese and continue to cook about 1 minute longer until top is set. 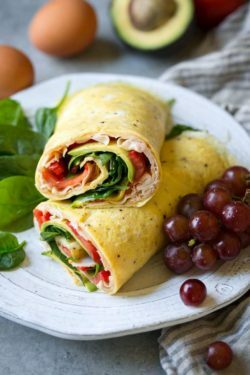 Remove from heat, layer on turkey, tomatoes, avocados and spinach. 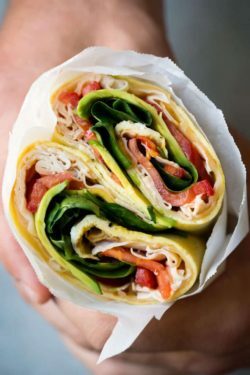 Roll up wrap, cut in half and serve immediately.